There’s no shortage of advice on teaching journalism students. 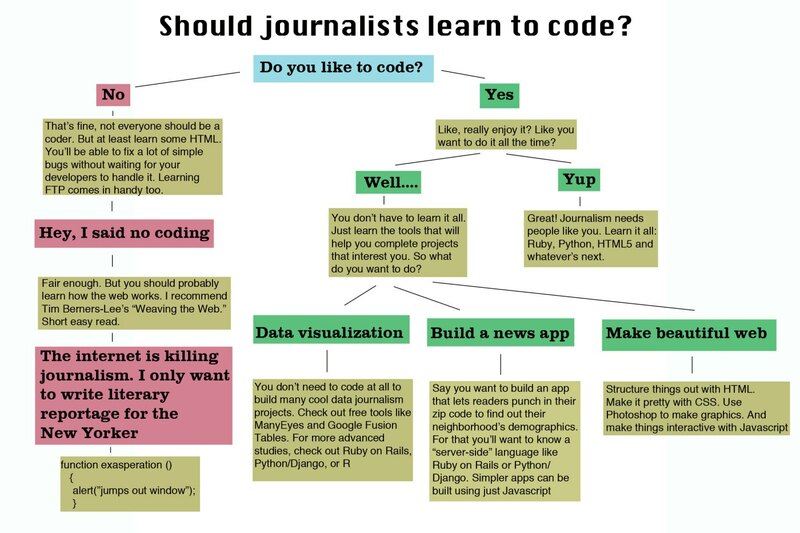 If you believe what you read, young reporters need to learn to code; not to learn to code; learn history of the internet (the flowchart above is from there), or the ‘technologies of the web‘. The fact that there’s so much discussion is easy to understand: it’s the traditional curse of journalism to almost take pleasure in a lack of numeracy. But in 2018, there can be no argument that being comfortable with data is an essential skill for journalism. It’s just a part of the landscape. At the same time, being a journalist is not just a collection of random technical skills to be learned in isolation from what they will actually mean in a newsroom. It’s not that long ago that even teaching journalism at all was considered new and novel — journalists would learn on the job. I spent a postgraduate year at City University, London in the early 1990s — when doing a course at all was considered an optional extra. Lots of journalists trained for getting to a national newspaper by doing their time on local newspapers, training to report by covering courts, police reports and local events. When I was training, I couldn’t imagine a world where I would be telling stories with anything other than with words (preferably as many as possible). I imagined my career success would be measured in lengths longer than 5,000 words apiece. That world does not exist at all today. What did I learn in the class of ’90? A lot about how competitive journalists can be, some stuff about journalism law which was outdated as soon as I got my first job; how to wait patiently until I could leave and start really learning how to be a journalist out there in the real world. Unexpectedly, shorthand is something I still use every day. It did help me get my first job, however — working for a trade magazine and running a database (really). The world had changed even within the year of my course. If that was true in 1990-91, how much more will the journalism have altered by the time 2019 comes around? Data journalism is changing all the time as the tools improve and develop. I’m about to turn this into reality and tomorrow I start teaching a short weekly undergrad course at the Medill Northwestern University campus in San Francisco. So, how do you plan a course in an area that shifts so much? My emphasis is on the stuff I’ve learned: working with designers, using free charting tools, sourcing and mapping data. I’ve deliberately decided to focus less on tools and apps than on how to be a data journalist. How do you generate story ideas? How do you sell them to a news editor? What makes a great data journalism student? I figure 10 weeks of generating story ideas and thinking about how to turn them into a great data journalism project is the best way I can help with the new generation of data journalists. It’s also a great way for us to experiment with we have done at the Google News Lab with our courses for data journalism. There’s also some great inspiration out there: Dan Nguyen’s course at Stanford and Derek Willis at Georgetown are both models in how to structure data journalism teaching. As a teacher and journalist, ProPublica’s Scott Klein offered great pointers too. My course guide is here and you can see the full syllabus as a spreadsheet here. Students will learn when data stories work (and when they don’t). The course is not about learning to code, or design but how to tell a data-driven story. The tools may have changed by the time they’ve finished the course but the principles of finding stories in data are constant. But what am I missing? Let me know what you think. This article has been updated and republished with up to date details. I, the retired engineer, have a lot of respect for journalists. Your world is evolving as fast as mine. But in perfecting your ability to present influential data have you considered that the world is mostly controlled by tribal belief systems built with considerable logic on false (or at least unprovable) facts? How do you get the data through the thick defensive layers of the believer’s brain? Can the blade of emotion cut deep enough? Hi I am doing a final year project for my Bachelor of Science with Honours in Web and Multimedia course, investigating data journalism by looking into the skills required to produce this kind of reporting. I wish I could enroll on your course, before I got into webdesign I was very much geared up to study journalism. Here at Uclan (The University of Central Lancashire) we have a module for the journalist students on data Journalism and I will be monitoring a data project they are going to begin next week based on the general election in May. My remit is to see how the non tech students fair against he tech ones and how much they need to learn to produce data visualizations even using online tools such as Google Fusion. I have to admit I tried to use Tableau last year and found it confusing and difficult so if you have learnt how to master it I would love to audit your class on the subject. After working with the BBC on a project this year involving Twitter I would also love to learn more about gathering and sorting social media data. Hi – so one option is to take this online free course. Some elements of it could be really helpful for you. I tend to agree with you. I was looking at your syllabus and it’s quiet like the one I have for my classes in post-graduation journalism courses were I teach data journalism in Portugal, at ISCTE-IUL. I think students can specialize more if they want to, but at this moment what I’m trying to do specially here, is showing them the kind of journalism they could be doing if the know how to work with data. And that there are stories to be told with data, and also stories that come from data.